It's Friday, protests are taking place in Iraq. Alsumaria reports that Shi'ite cleric and movement leader Moqtada al-Sadr issued instructions yesterday for his followers which included that they take part in peaceful actions and not damage private property, that they not wear military uniforms while protesting and that they not carry photos/placards/banners with photos of any political or religious official. In the image above, the top right is Moqtada al-Sadr and below him is Ammar al-Hakim. Ammar is the leader of the Islamic Supreme Council in Iraq. If he's now supporting the protesters, that would be a big switch from his remarks earlier this week. "If we cannot provide enough electric power for the Iraqis, why don't the families buy private generators?" asked an Iraqi official during a recent press interview. It was similar to the quotation misattributed to French Queen Marie Antoinette two hundred years ago; if the people don't have bread, "Then let them eat cake." Again, like the French, the Iraqis revolted by igniting the uprising in Basra. This spread around the country and this time the Iraqi leaders could not blame the Yazidis, which they had done in the past when there was activity in Iraq's western cities. Those who gathered in Iraq's Tahrir and other Squares did not belong to a specific sect, race or party. They gathered as Iraqis and expressed their anger at their rulers who have subjected them to decades of failure, with neither justice nor anything as mundane as new building projects. Instead, the leaders conspired in the name of religion to loot the country's wealth and used its resources to satisfy their evil desires and feed their obsession for money and power. al-Saadoun goes on to note how the Iraqi government went on to blame the Islamic State with Ammar al-Hakim (leader of the Islamic Supreme Council of Iraq) insisting that the protesters themselves were members of the Islamic State. How very sad events have been for al-Hakim. His relationship with the US has soured. 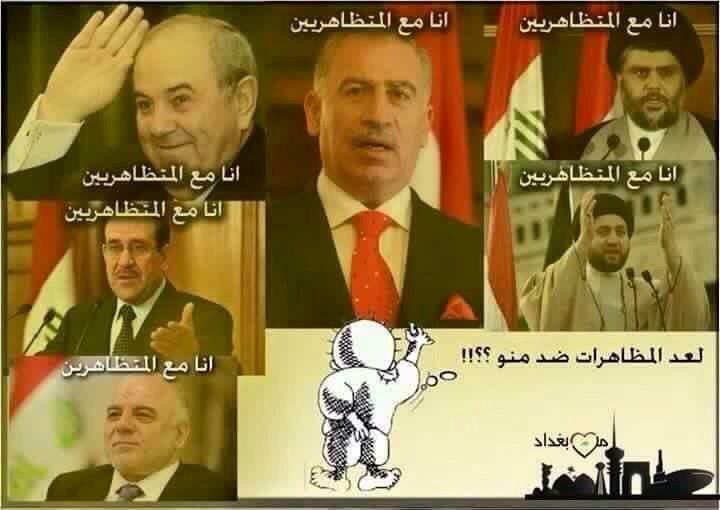 He's not moved forward or higher in the political hierarchy of Iraq. And now he's attacking the people in a manner that recalls Nouri al-Maliki's ridiculous attacks on the protesters. So if Ammar is now supporting the protesters, that would actually be major news. الناطق باسم ميليشيا العصائب يعترف بأنهم سيشاركون في التظاهرات؛ للوقف بوجهها اذا كانت ضد الاحزاب أو الميليشيات . The video is of the spokesperson for the Shi'ite militia (thugs) the League of Righteous commenting on the protests. For those who have forgotten, their leadership was held by the US military after they'd killed five US troops in a single attack. They were supposed to go on trial but then US President Barack Obama let the leaders go after negotiating with the terrorist group and getting their promise that 5 British hostages would be released. 4 immediately were -- one alive and three corpses. Then, years later, after the League had mocked Barack publicly and repeatedly, they released the fourth corpse. This morning the New York Times' Alissa J. Rubin and Michael Gordon offered "U.S. Frees Suspect in Killing of 5 G.I.'s." Martin Chulov (Guardian) covered the same story, Kim Gamel (AP) reported on it, BBC offered "Kidnap hope after Shia's handover" and Deborah Haynes contributed "Hope for British hostages in Iraq after release of Shia militant" (Times of London). The basics of the story are this. 5 British citizens have been hostages since May 29, 2007. The US military had in their custody Laith al-Khazali. He is a member of Asa'ib al-Haq. He is also accused of murdering five US troops. The US military released him and allegedly did so because his organization was not going to release any of the five British hostages until he was released. This is a big story and the US military is attempting to state this is just diplomacy, has nothing to do with the British hostages and, besides, they just released him to Iraq. Sami al-askari told the New York Times, "This is a very sensitive topic because you know the position that the Iraqi government, the U.S. and British governments, and all the governments do not accept the idea of exchanging hostages for prisoners. So we put it in another format, and we told them that if they want to participate in the political process they cannot do so while they are holding hostages. And we mentioned to the American side that they cannot join the political process and release their hostages while their leaders are behind bars or imprisoned." In other words, a prisoner was traded for hostages and they attempted to not only make the trade but to lie to people about it. At the US State Dept, the tired and bored reporters were unable to even broach the subject. Poor declawed tabbies. Pentagon reporters did press the issue and got the standard line from the department's spokesperson, Bryan Whitman, that the US handed the prisoner to Iraq, the US didn't hand him over to any organization -- terrorist or otherwise. What Iraq did, Whitman wanted the press to know, was what Iraq did. A complete lie that really insults the intelligence of the American people. CNN reminds the five US soldiers killed "were: Capt. Brian S. Freeman, 31, of Temecula, California; 1st Lt. Jacob N. Fritz, 25, of Verdon, Nebraska; Spc. Johnathan B. Chism, 22, of Gonzales, Louisiana; Pfc. Shawn P. Falter, 25, of Cortland, New York; and Pfc. Johnathon M. Millican, 20, of Trafford, Alabama." Those are the five from January 2007 that al-Khazali and his brother Qais al-Khazali are supposed to be responsible for the deaths of. Qassim Abdul-Zahra and Robert H. Reid (AP) states that Jonathan B. Chism's father Danny Chism is outraged over the release and has declared, "They freed them? The American military did? Somebody needs to answer for it." Remember that the next time Barack claims the US government does not negotiate with terrorists. The protests are attracting a lot of attention in Iraq. Last Saturday, Iraq's prime minister dubbed them a "warning sign." Looks like he's facing more warning signs today. All Iraq News notes, "The Supreme Religious Authority said that Prime Minister, Haider al-Abadi, has to avoid the partisan confesionalism and uncover those who hinder reforms." And they note, "The Supreme Religious Authority called Prime Minister, Haider al-Abadi, to cancel all former and current key officials' privileges." As Doris Day sang . . . THIS JUST IN! HE'LL ALWAYS HAVE DAYTONA IN MARCH! The e-mail address for this site is common_ills@yahoo.com.